In the culinary arts, the term IQF stands for "individually quick frozen." IQF foods are notable for the fact that each individual piece of food is frozen separately from all the others. 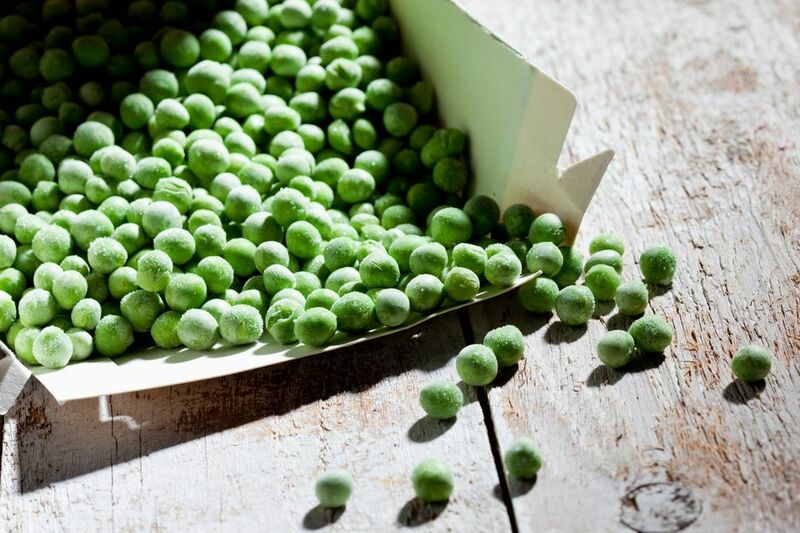 For example, a bag of IQF peas doesn't simply contain a solid block of frozen peas; rather, each of the individually frozen peas is loose inside the bag, making them much easier to work with. Common examples of IQF foods are fruits like blueberries, strawberries, and peaches; vegetables like corn, peas, and green beans; seafood like shrimp and scallops; or poultry, like individual chicken breasts. Even whole poultry, such as frozen turkeys, are processed using the IQF method. Also called flash-freezing, the IQF method involves sending the individual food items on a sort of conveyor belt into a blast chiller that freezes the item very quickly. Because the food items are separate when they go in, they stay separate after they've been frozen. The process was developed by a biologist who, while ice fishing in Canada, noticed that the fish he pulled out of the water beneath the ice would instantly freeze solid when he tossed them on the snow. Even more remarkable, however, was the fact that some of these fish would still be alive after they thawed. This surprising result has to do with the fact that when something freezes quickly, it forms smaller ice crystals than when it freezes slowly. Bigger ice crystals damage cells and tissue fibers. When those fish froze, the ice crystals were too tiny to rupture the cell walls, so some of the fish survived. This same principle is at work with IQF or flash-frozen foods. The reason foods degrade when they're frozen is because large ice crystals damage the fibers of the food, making them limp and dried-out. The ice crystals squeeze the fibers, forcing the food's water content out of the ruptured cell walls. Quickly freezing the foods produces ice crystals that are small, and thus do not cause damage to the fibers of the food. Specifically, this is because ice crystals only form between 31 and 25 degrees F. The longer a food item spends in this temperature range, the more ice crystals will form. The key to IQF is speeding the food through this 31 to 25 F temperature zone as quickly as possible. For example, it might take ten hours to freeze a package of fish via conventional freezing (i.e. you putting it in your freezer at home). Using IQF technology, it might only take 90 minutes. But crucially, instead of spending a full six (out of 10) hours in the 31 to 25 F zone in the conventional method, it only spends 25 minutes there using IQF. By the way...the name of the ice-fishing biologist who discovered and applied this process to commercially packaged foods: Clarence Birdseye. How Long Will Dried Beans Keep in Your Pantry?